Napoleon Bonaparte abdicated as Emperor of France in 1814. Born in 1769 on the island of Corsica, Bonaparte early showed a talent for the military. During the French Revolution he was a hero and became a major general. In 1804 the people voted him to be emperor. He expanded his kingdom to include most of Europe. However, he was unable to keep the kingdom intact. He was defeated in Russia and at Leipzig in the Battle of Nations. He abdicated in 1814 and was exiled to Elbe in the same year. He briefly returned to power before he was defeated at Waterloo. In 1815 he was exiled to St. Helena and died there in 1821. Apollo 13, the nearly fatal space mission to the moon, was launched in 1970. 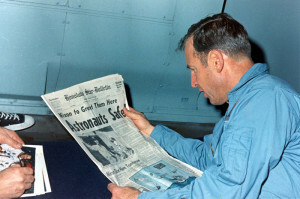 Astronauts John L. Swigert, Fred Haise, and James A. Lovell were on their way to the moon when an oxygen tank exploded. Their craft was severely damaged, and they had a great deal of difficulty returning home. The world held its breath until the craft fell safely into the Pacific Ocean on April 17, 1970. 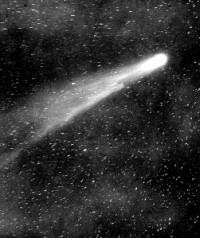 Halley’s Comet made its closest approach to earth yet in 1986. Edmond Halley discovered that certain similar comets had been seen in 1531, 1607, and 1682. He concluded the sightings were of the same comet. It was named in honor of him. The comet appears roughly every 77 years, approaching earth again mid-2061. Children can learn more about Halley’s Comet and comets in general at: http://www.sciencekids.co.nz/sciencefacts/space/comets.html. Edward Everett (born Dorcester, Massachusetts, 1794; died Boston Massachusetts, January 15, 1865) was a famous politician and orator. He gave the main address at the dedication of the Gettysburg National Cemetery on November 19, 1863. His speech was very long. President Lincoln’s now famous speech took less than two minutes. Afterward, Everett realized the greatness of Lincoln’s speech and stated it would last for generations. Graham Salisbury (born Philadelphia, Pennsylvania, 1944) is a musician and writer of children’s books. His books include the Calvin Coconut series and Under the Blood Red Sun. Children could visit his website at: Graham Salisbury.